Welcome aboard our Waikiki Catamaran Snorkeling Excursion. 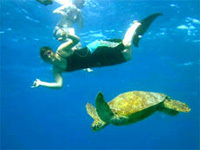 Cruise along the beautiful and famous Waikiki shoreline and snorkel in the blue Hawaiian waters. You can expect to see exotic colorful fish and sea turtles and dolphin sightings are very common off the bow of our catamaran! Your day begins as we depart from our marina and sail the blue Hawaiian waters along the shoreline of picturesque Waikiki Beach. 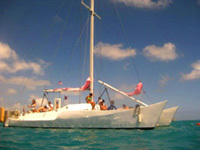 Sit back, relax and enjoy a morning sail on our luxury catamaran sailboat. Snorkeling off of the coast of Oahu's Waikiki Beach is stunning with crystal clear waters, colorful tropical Hawaiian fish, graceful sea turtles, as well as occasional spinner dolphins. Once at our favorite snorkel site, your friendly crew will assist you in every way possible to make sure you are comfortable and ready to jump in for an amazing snorkeling experience. 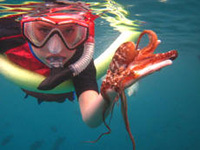 You will snorkel in waters that are around 20 feet deep, and floatation devices are available for your use. Your morning on our Snorkeling Catamaran Sailing excursion off of the coat of Oahu is designed to give you a truly memorable and idyllic day in Oahu. This tour is designed to be a fun and relaxing experience for people of all fitness levels and all ages. 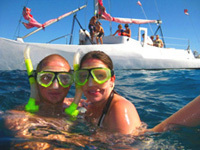 Our catamaran has limited capacity, so please book early to insure your seats on this incredible adventure. Recommendation: This Snorkeling Adventure tour is recommended for everyone, whether you are a beginner or advanced swimmer.